The other day I was on FaceBook for a moment and saw a post that really hit me because it spoke to something that has recently (as in, within the last week) shifted within me. For all of my growing up years, I was awkward. I was different. I was the one who didn't fit in. At all. This is the post I saw on FaceBook that prompted me to write this entry on my blog. 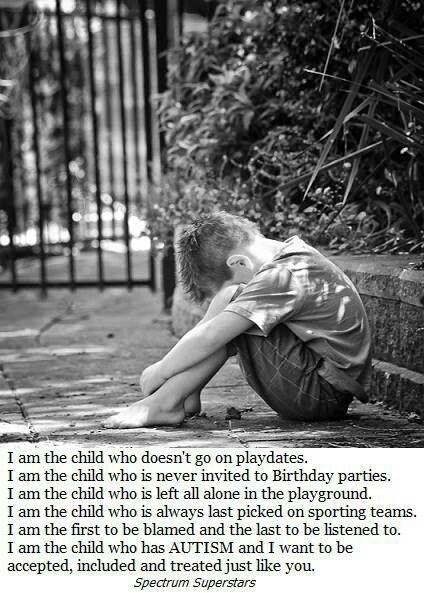 After reading this post I found myself tempted to step into a place of self-pity...this was my life. This is exactly what it looked like. Never invited to play. The last birthday party I was invited to I was 5 years old. (Not as an adult, but up until I was grown and married it was that way.) No one came to my birthday parties either. My sixteenth birthday I invited 25 people. No one came. Not one. On the playground, if I was even allowed to play the game, I was definitely the last one picked. I don't know that I was the first blamed, but I was the last to be listened to. And all I ever wanted was to be included and part of the lives of the people around me. But, as I read this and noticed my desire to cry and say how sad life is, I remembered what has happened to me this last week. And as I thought about what has shifted and changed for me, I also realized from where the problem stemmed. The adults in my life and maybe two or three kids I grew up with felt sorry for me. They pitied me because they saw how much my life was hurting my heart. Or, even more likely, they saw what I was missing that they had enjoyed and experienced. They ached for me because I didn't have what they thought was essential to childhood happiness. In their pity they reached out and tried to share in my pain. And because I could feel them, I started to believe that pity = love. Wouldn't you know, 30 years later, I discover that isn't the truth. Pity ≠ love. Not even close to it. Pity comes from a place of darkness. It comes from a source of doubt, of not believing in me, of not hoping for me. Pity says that I'm not enough. It doesn't tell me that the kids around me are being cruel, it tells me that I'm somehow flawed. Pity is a burden. And as I grew, when I needed love, I sought out pity. I thought that was love. That's how I understood it and what it always seemed to be. A couple of years ago I met a woman named Vica. Her daughter was one of my students and Vica very quickly became a dear friend in my life. She taught me many things and she helped me to see that I could be more than I was currently being. She believed in me in a way that no one in my life had before - and certainly far more than I believed in myself. This was the beginning of a change within me. But I still defined pity as love. And when I didn't feel loved, I sought out pity. And I had no idea I was doing it - I was completely blind to this fact. Then I met a girl named Erin. She taught me so much about love. Love of myself, mostly. She taught me what it feels like to be loved and not to be pitied. (Don't misunderstand me, I've many people in my life who love me. But I couldn't see it because I have been so accustomed to defining pity as love because of the view from my childhood.) Erin was the first friend I've ever had who was my friend, from the start, because she liked me for me. Not because I did something for her and then she got to know me, but because she genuinely just enjoyed my company. I've many friends who feel that way now. But none of them felt that way from day one. I was an acquired taste for all of them but Erin. And the miracle about this friendship is that when I felt like I needed love and would come asking for pity, she never did give in. She always heard me, had compassion for me, but never pitied me. She continuously loved me, no matter what I did or said. She just brought light and love over and over again. Then I met Cyrena. She is another friend like Erin - she wanted to be my friend from the beginning. She wanted me in her life and invited me in whole-heartedly. And for the first time in my life I have had experiences of feeling loved, not pitied, in every interaction with this dear friend. Do you know what I learned from my friends? Pity ≠ love. Love feels so very different from pity. Love is ennobling, empowering, uplifting, and so many wonderful things. Love breeds hope. Love breeds compassion, not pity. There is such a big difference. Love brings light. As a child, I had a problem. The more pity I experienced, the more likely it was that I would seek pity. Which meant that I would live far below my potential. I had to. Because if I were to step into the realm of living my life on purpose - if I were to truly let my strength come out and show those who pitied me that what they saw as weaknesses or flaws or frailties that made me different were actually the beautiful pieces of my greatest gifts - if I were to do that, there would no longer be any pity given. I would be awesome. And we don't pity awesome. If children are pitied when they need to be loved, they will become people who live far below their privileges. So what does it look like to love instead of pity? I'm going to share a couple of thoughts and I'd love to hear your thoughts as well. Please, please comment and tell me how you feel they are different and what it looks like to be acting out of love vs. pity. This is all still new to me, so I haven't sorted it out completely. But I know it feels different. I know when I am talking with a person who enjoys me for the sake of me it feels very different than when I am talking with someone who feels sorry for me or who just needs my help. The people who feel sorry for me are, by their bleeding hearts, encouraging me to shrink, to stay small, to give less than I am able because we only pity that which is week and incapable. When someone loves me, it encourages me to do better, to grow, to become my best and highest self. I am so grateful to my friends Vica, Erin, Cyrena and many others who came before them who loved me but I couldn't see it. I mistook what was given because I didn't know what it was. I still am not sure how to say what it looks like. I just know what I feel coming from others. Pity feels like I have to shrink in order to keep getting what they are giving. Love feels like I can expand and it will keep coming to and growing with me. I hear people talk all the time about how amazing their kids are, how talented they are, how smart they are, how gifted they are. If you really believe it and feel it, then show it. Don't pity them. Your pity says they aren't enough. It says they're defective. It says they need someone to hover and protect because they are too different to be accepted by anyone for the person they are. Pity is the worst thing in the world. Don't feel sorry for me. If you believe in me, then it would never even occur to you to pity me. And if you pity me, then you don't really see me as the strong, talented, smart, gifted person that you say I am. Pity only comes from one place...a belief that I can't, I'm not, I'm only, shrinking, shrinking, shrinking. Small, small, small. That is where pity finds it's source. So next time your loved one comes home and is sad because he was the last one picked for the team or she was not invited to the party, don't let your heart ache. Instead tell them all the good you think and feel about them and build them up. Don't focus on the thing that hurt, that just brings them down. As my good friend, Vica, always says "That which we focus on expands." What do you want to expand? Pity? Or love? I choose love. And I feel bigger and brighter because of it.